If you are aged 12 (and in Year 8 at school) to 17 years old and interested in becoming an Air Cadet, why not drop into the Squadron and have a chat with one of our uniformed staff. 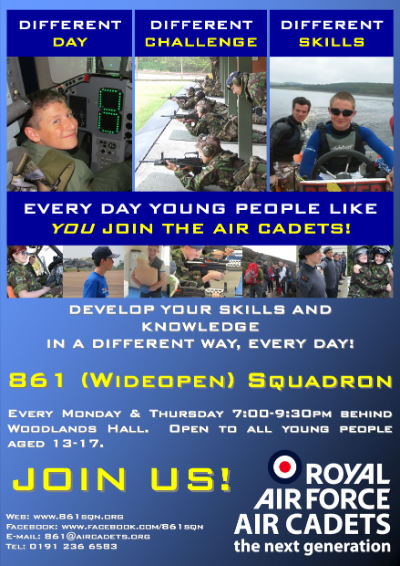 The Air Cadets could be just the thing you have been looking for – you never know until you try!! Joining the Air Cadets gives you a way to find self-confidence and self-esteem and to discover the values of good citizenship. If you think you are up to the challenge, or want to find out more then come down on a Monday or Thursday evening between 7.00pm and 9.00pm and we will show you around the Squadron and answer any questions that you have. Please feel free to bring your parent/guardian! Alternatively, email 861@aircadets.org for further information and one of our volunteer staff will get back to you!